SAGE has never shied away from autographs. In fact, they're a big part of what has driven their draft and prospect releases in recent years. 2012 SAGE Next Rookies Football may be their most premium set to date. Promising only autographs, the high-end release comes with an extremely limited print run and signatures from some of football's most notable 2012 rookies. Boasting two autographs per pack, each card is numbered to 50 or less. Most eight-pack boxes will have a multi-signature card and autographs from two first round picks. Dual Autographs are numbered to 10 or less. 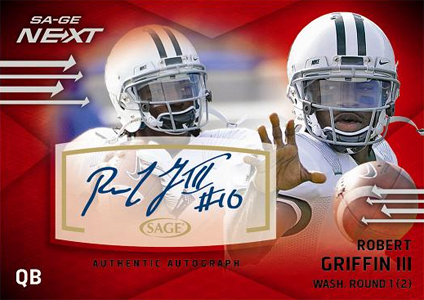 2012 SAGE Next Rookies Football also has random triple autographs. SAGE promises that all cards are inserted in packs meaning that there are no redemptions. Autographs are printed on thick 48 pt. card stock giving them a premium feel to go along with the premium price point. Among the signers in 2012 SAGE Next Rookies Football are Robert Griffin III, Trent Richardson, Ryan Tannehill, Justin Blackmon, Brandon Wheedon and Michael Floyd. Collectors will not find Andrew Luck in the set, though, because of his exclusive non-NFL deal with Press Pass. Aiming for something a little different with their packaging, 2012 SAGE Next Rookies Football comes packed in envelopes rather than traditional packs. Each envelope comes with a tear strip, making them safe and easy to open. It also protects packs from tampering. 2012 SAGE Next Rookies Football is limited to 400 numbered boxes, to date the company's smallest print run. Love the SAGE Rookie Cards. I mainly like them cause they usually are the 1st cards with all the Rookie autographs BEFORE we know who will be a super star. I love collecting the autos and the EXCITEMENT of wondering which ROOKIE auto will be the MOST SOUGHT AFTER, after they BLOW UP and become a superstar. 2012 Topps Inception Factory Sealed FB Hobby Box 2 AUTOS Nick Foles RC ? ?